Well, the BBC Radio 4 Gardeners’ Question Time (GQT) team did better than usual with how-to-grow-mistletoe question this week. This week they did better but, to be fair to them, they didn’t quite get the chance to talk in that much detail about methodologies – so maybe they would have done the same as usual (i.e given totally incorrect advice) if given more time. The episode was an unusual one, set as if in Ambridge, the fictional base for the Radio 4’s The Archers, their long-running drama series. So whilst the questions were real, the questioners were all actors from the soap, and related to locations/themes in the soap. 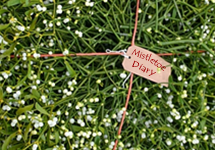 And so the mistletoe question related to the minor storyline from January time where gullible customers are sold dodgy mistletoe grow-kits (as opposed to decent mistletoe kits!) – some sold with optional ‘druidical services’ to help it grow. Our questioner was Vicky Tucker who had been advised, by the unscrupulous Grundies, to plant her berries in January, on the underside of a branch on an oak (she didn’t take up the robed druidic planting offer). Was this advice correct she asks? Underside of branch is good, says Bob (and so do I, well done Bob). Bob also says that a ‘key’ factor is that in nature mistletoe seeds pass through a bird’s gut and this ‘breaks down the seed coating and aids germination’. Maybe Bob, maybe. But hardly helpful unless you have a handy bird. And unlikely to be a ‘key’ factor as seeds germinate quite well without this (see previous point above). And Bob then ruins his claim entirely by saying that birds wipe the seeds from their beaks – in which case, Bob, they won’t be passing through their gut… Please be consistent Bob. (For the record, no the seeds aren’t helped by passing thru the gut, and yes some birds (mistle thrushes) swallow them and excrete them undigested, whilst others (blackcaps) wipe them off the beak, uneaten. Humans wipe them off their fingers, and it works just fine, no bird gut/digestion required at all). Re the choice of oak, Bob says, correctly, that this is a bad choice, and not a good host for mistletoe. He then goes off-piste again with a statement that the best host is the same species as the host that the seeds are from. Again, maybe, Bob, maybe. But there’s, er, no evidence for that, and plenty of evidence that this isn’t an important factor at all. Mistletoe seed from, say, a poplar tree will grow perfectly happily on apple, rowan, hawthorn etc etc. You just need to pick one of the susceptible species, not the exact same one. Propagating (geddit?) that old gardeners’ tale of host matching is scarcely helpful is it Bob? So, not bad, GQT team, but you could still improve. I’d give it 5/10, and mark it ‘could do better, Bob’. Listen again, if you’ve got time this week (it’ll be unavailable later) at http://www.bbc.co.uk/iplayer/console/b010lyyd It’s the section from 28.00 through to 32.00.